For an overview of the editor's interface, see Editor interface overview. When editing, spawners are seen in the realtime editor as Particle layers, and they contain the whole particle definition. When added to the world, the particles are initialized by a Spawn script, before being added to a special particle container called a Particle medium. 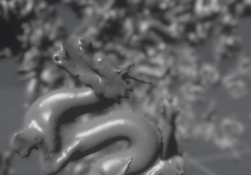 Particle mediums have a simulation definition, called an evolve state attached to them, telling the PopcornFX runtime how to update the particles. Each evolve state contains a list of 'Particle evolvers'. 'Particle evolvers' are objects that take a list of particles each simulation frame, and applies some operation to them. Notable particle evolvers are the Physics evolver, the Rotation evolver, and also the Field evolver, that allows you to animate a particle property through time using a user-defined curve. For performance considerations, a particle medium will often contain particles coming from different instances of the same spawner, and even from instances of different spawners, that share the same simulation state. A spark effect with a single layer, spawning 10 particles, will use a single particle medium, that will contain 10 particles. If 10 000 instances of that spark effect are spawned into the game world, there will still be a single particle medium, that will contain all the 100 000 particles of all the instances. 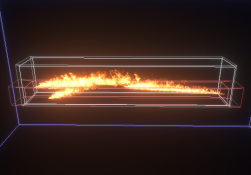 Particles are rendered through 'Particle renderers'. As there are particle mediums for the simulation, there are particle render mediums for the rendering. A particle render medium can render one or more particle mediums. For example, if two particle layers have different evolve states, but share the same particle renderer (the settings are the same), then they will share the same render medium, and be rendered in a single geometry batch / draw call. 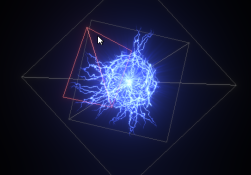 Particle scripts can use 'Particle samplers', either to directly set into a particle field, or to use in some intermediate computation. 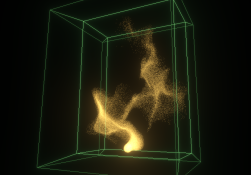 Notable particle samplers are the Shape sampler, the Curve sampler, and the Procedural turbulence sampler. Particle events can be triggered when something special happens, such as when a particle is born, dies, or collides with the physical world. They can trigger the instantiation of other particle effects. The C++ runtime also allows user game-code to be notified when a specific particle event is triggered. Particle events are useful for many things, ranging from fireworks, to spawning sparks, decals or even sounds when particles collide with the world. 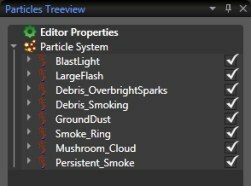 Last but not least, Particle effect attributes can be defined. They are vector values global to a specific instance of a whole particle effect, and can be accessed from scripts anywhere inside any layer of the effect. Particle attributes are useful to allow gameplay code to control particle effects behavior on a per-instance scale. When activated, it records all the previous simulation frames, up to a maximum user-defined amount, and allows you to play them back and inspect them. Telling you very explicitely when something unusual could badly hurt performance. Not directly related to particles, but can be useful to see what's going on when rendering custom backdrops, if it doesn't produce the result you'd expect. Allows accurate timing of code-sections, and allows to view an entire frame, and what took time computing. also helps tracking memory transactions and threading issues. "But scripting is slow, right?" A script is not run once for every particle, but instead, it is run once for a large batch of particles. Each operation will run in a massively parallel fashion and process a whole array of values in one go. When you write something like a = cos(b * c);, if 'b' or 'c' have a stream qualifier, the compiled script can be fed a large array of values, and that simple line will expand into two streamed operations: a vectorized multiplication that performs all the multiplications for the whole batch, then a vectorized cosine that performs all the cosines on the whole batch in one go. The script compiler performs optimizations, and is able to fold expressions pretty aggressively. It knows which values vary per particle, which values do not change across a whole particle batch, which values do not change across a whole simulation frame, and which values do not change at all, ever. Here, 3.478 would be the inverse of the integral of that specific curve between 0 and 1. The compiler will see the function call can be precomputed, call it at compile time, and bake the results in with the other constants. It's allowed to do that only if the curve is local to the layer, therefore cannot change at runtime. Otherwise, if the curve was an attribute sampler, the optimizer couldn't make any assumptions, and leave the sample call in the final script, as the curve data could be overridden at runtime by the game code. In addition to all that, the code that executes the script instructions is heavily optimized and hand-tuned, using each target platform CPU's specific SIMD instruction set. Also, since v1.9.0, we have an experimental GPU backend that generates D3D11 GPU compute shaders, for even faster execution. This page was last modified on 10 May 2018, at 08:49.